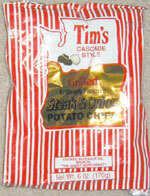 Taste test: These taste just like grilled steak and onion. They're incredibly crunchy and thick and remind us of steak with A1 sauce. Possibly the best meat-flavored chip we've tasted. Smell test: Slightly oniony, not too strong. This snack was discovered by Keith and Melissa in Las Vegas.